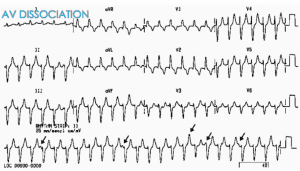 Here is a simple case of potential ventricular tachycardia(VT) How do you manage this? The patient is obviously unstable, so the management decision is easy: ELECTRICITY. What if the patient is stable with a BP of 138/65 and is sitting up in bed texting on their phone. Many would argue for the same treatment. However, the fact that they are stable does mess with our minds, just a little. We become unsure. We may subconsciously weigh up the risks of sedation and delivering electricity to giving a drug. It sets up a degree of uncertainty. Sometimes we should just sit back and think and watch rather than do. The problem with these rules is that they are not sensitive enough and they lack consistency across observers. If you sit a group of cardiologists down and ask them to apply them, they will disagree. Is it faster than 120 beats per minute? For monomorphic VT, the rate must be greater than 120 beats per minute in order for the diagnosis of VT to be made. 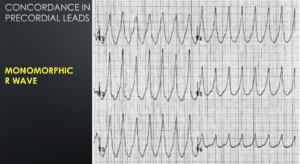 The example above of the 19 yo with WCT, who had a bradycardia arrest post amiodarone, demonstrates a rate of 114 beats per minute. It was not VT.
Is it wider than 120ms? This is based on the Brugada algorithm which confirms VT if RS> 100ms. I make it easier by looking at the QRS and asking if it wider than 3 small squares. A simpler way of saying this is, do all the precordial leads predominantly point in one direction? Is there a characteristic morphology? Are there Capture Beats or Fusion Beats? Is there a Right Bundle Branch Morphology in V1? Look for the Rsr pattern ie., the right rabbit’s ear being up. Is there a Left Bundle Branch Morphology in V1/2? The distance from the QRS onset to the nadir of the S wave being >100ms. It confirms VT.
Is there a QR in V6? 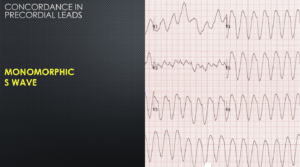 Below is the Video of my Lecture from this year’s Cardiac Bootcamp. This video and many others can be viewed by purchasing a subscription to EMCORE Digital.